Being a professional is about getting it done right - the first time. That’s why our experts created easy-to-follow instructions for some of our most popular product applications. Not all small openings need to be round. While many small holes are core or stitch drilled, the time saved with a square hole may reduce costs. 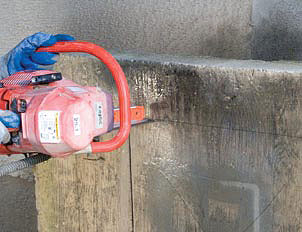 A small opening can be made in as little as 5 minutes with ICS concrete chain saws. 1. Score cut the opening on all 4 sides; 2 minutes. 2. Plunge cut each side starting at the center of each cut and working toward the corners – 3 minutes. 3. The result: A small opening, with perfect corners and no overcuts. Total elapsed time: 5 minutes. 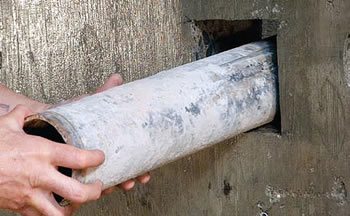 Diamond Chain Technology allows remodelers to easily add windows and egress windows to additions and basement remodels. 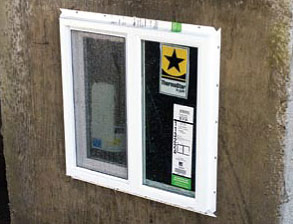 Because there are no overcuts, water proofing issues around the windows are reduced. 1. Layout and score cut the entire opening to 1” (2.5 cm) deep – 6 minutes. 2. Cut the bottom first to avoid pinching the bar in cut. 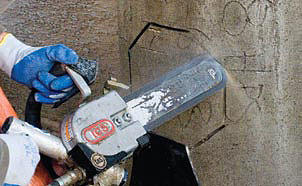 Plunge saw into cut and cut to the corners on each side – 12 minutes. 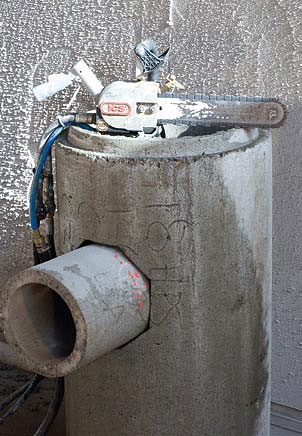 While ICS concrete chain saws won’t cut round circles, they can easily make 8-sided cuts, providing quick, tight fitting joints for concrete pipe taps. With proper technique, gaps of less than 1” (2.5 cm) are easily achievable, requiring very little patchwork. 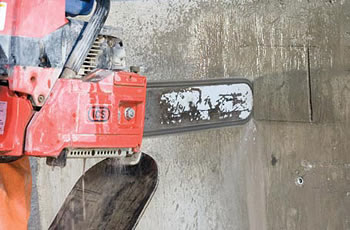 The same job with a cut-off saw takes longer, results in overcuts, and requires the use of potentially damaging percussive tools to finish the work. 1. Carefully score cut all 8 cuts – 3 minutes. 2. Plunge straight into all 8 sides in a stitching method working from the center to both ends of each cut – 12 minutes. 3. The result: A pipe tap with less than one inch gap installed, no over-cutting or cracking from percussive tools. Note: Proper attention to layout and keeping the bar perpendicular to the pipe are important for tight joints. Total elapsed time: 15 minutes. Background - Castle Drogo is located high above the Teign Valley with sweeping views of Dartmoor, England. Built in 1931 for a wealthy retail magnate, it can truly be regarded as Britian’s last castle. The challenge - The lofty location of the castle allows for stunning photos and beautiful views, but has exposed the building to the legendarily tough weather. Due to the higher altitude and exposed nature of the landscape, climatic conditions are more extreme; generally warmer, wetter and windier than the rest of the country. These conditions have caused the roof and windows to leak and therefore need to be replaced in order to save this national treasure. 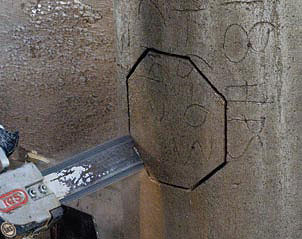 The castle is protected by a conservation order, meaning none of the visual elements can be defaced or altered. This requires that the granite blocks remain intact when removed. 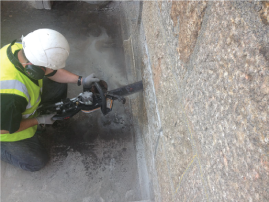 The solution - The contractor needed to cut out granite blocks so repairs could be made in the voids of the stonework, making the building water tight. The blocks would then be replaced in their original positions. The initial method of stitch drilling was a solution, but a slow one. Each block took 3.5 hours to remove. This is where ICS stepped in to help. 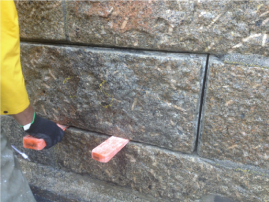 Using the hydraulic power saw and ProForce™ chain, they were able to cut around the mortar joint and pry out the block with pinch bars. 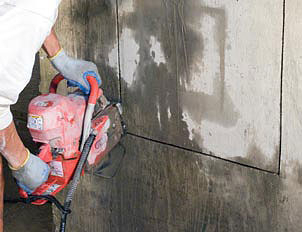 The result - The cutting time was reduced from 3.5 hours per block to 25 minutes. 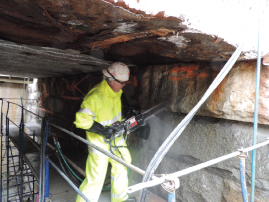 With the first phase of the project being to cut 250 linear meters (820 linear feet) at 30 cm (12 inches) deep, this saved days worth of time all while preserving the historical significance of this grand castle. 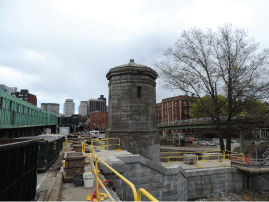 Background - When the historic Longfellow Bridge connecting Boston and Cambridge MA needed rehabilitation, a local Boston contractor partnered with ATS Equipment, a long time ICS distributor to get the job done efficiently and accurately. The challenge - This bridge built in 1908 handles 28,000 vehicles per day along with 90,000 transit users on the MBTA Red Line and a large number of pedestrians and bicyclists. Several factors have contributed to the deterioration of the bridge including weather, pollution and increased traffic. 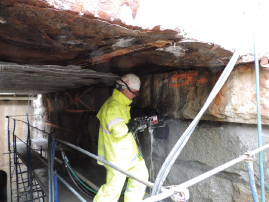 Block openings needed to be cut in the 24” thick granite substructure to update the utilities that run below the bridge. 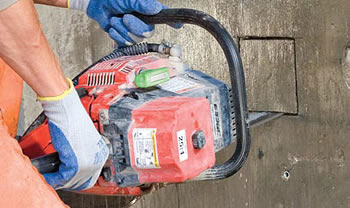 The contractor’s original equipment only cut 20” deep, which brought the work to a slow, agonizing crawl. 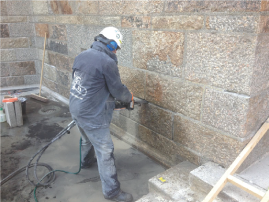 The solution - ATS Equipment stepped in and provided the ICS hydraulic power saw set up with 25” ProForce chains and P110 power pack, These tools allowed the contractor to cut all the way through the granite blocks from one side, with no overcuts, minimizing any additional damage to the historic structure. The result - With the ICS saw, production immediately increased from three to nine openings per day. That’s good news for the Massachusetts Department of Transportation and even better for the commuters who use that bridge daily.